For the company's fourth mission of 2019 — and the second this year with the Soyuz medium launcher from the Guiana Space Center (CSG) in French Guiana — Arianespace will be launching four additional O3b satellites for SES. By performing the 22nd Soyuz flight from the CSG, Arianespace is supporting, for the fifth time, SES in their expansion of their NGSO satellite constellation. Operational since 2014, the O3b MEO satellite constellation delivers fiber-equivalent connectivity and is part of SES's vision of connecting people and empowering them with opportunities. 12:30:37 p.m., in Washington, D.C. 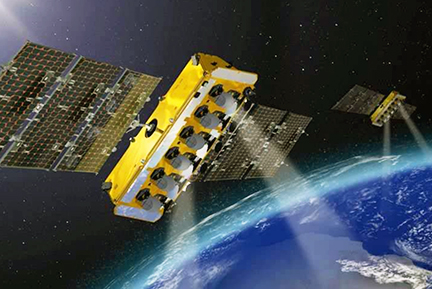 Artistic rendition of an SES O3b satellite. The nominal duration of the mission (from liftoff to separation of the satellites) is 2 hours, 23 minutes and 51 seconds. The altitude at separation will be approximately 7830 km. with an inclination if 0,04 degrees. 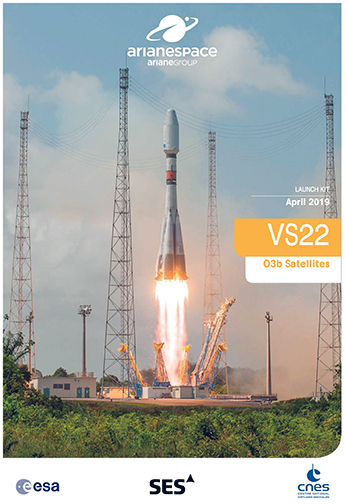 The Launch Readiness Review (LRR) will take place on Wednesday, April 3, 2019, in Kourou to authorize the start of operations for the final countdown. The O3b satellites lofted by Arianespace on Flight VS22 are the 58th, 59th, 60th and 61th satellites to be launched by Arianespace for the global satellite operator SES. The four new Ka-band satellites will join SES’s existing constellation of O3b MEO satellites, orbiting at approximately 8,000 km. from Earth and serving customers based in almost 50 countries. They will improve connectivity capabilities, increase performance, and serve to seamlessly scale the existing O3b constellation.